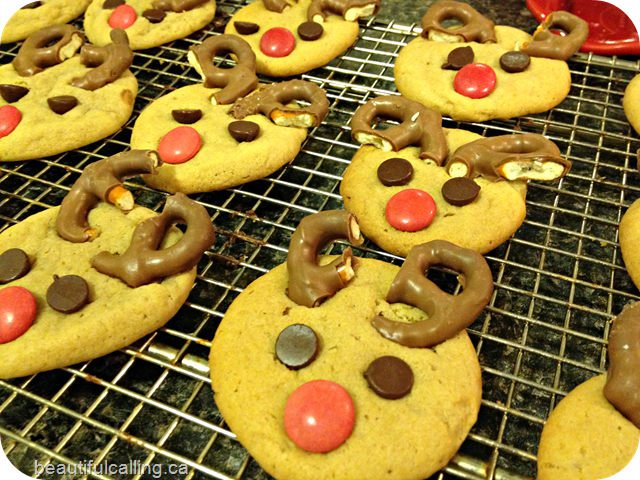 These Peanut Butter Reindeer Cookies were super easy to make and absolutely adorable. The recipe came from BakerGirl. I had been planning to make them with my children but realized that the nose, eyes and antlers needed to be put on directly after they are removed from the oven otherwise the cookies set too much for them to stay on. Alas, due to the hot pans, the children didn’t get to decorate them but they enjoyed eating them very much!! Continuing on with our deer theme, I went up to my parents with my bow. My first year bow hunting for a deer…I was really hoping to get one. However, it was not to be. My sister was also visiting that week and between my children and hers, the yard and property was just too busy for the deer to come around. That, and I had a fever and was ill the entire week. I did have a couple evening deer sightings though, just not during legal hunting time. I thought perhaps I would get back up before the season ended but that didn’t work out as planned either. Oh well. No deer but the reindeer cookies were pretty tasty anyway.